This National Trust Felbrigg Garden Shed has recently been installed in our customer’s garden in Godalming, Surrey. This Felbrigg is 1.8 x 3.0m in size, which is our medium sized Felbrigg; this will give the customer plenty of room to store their gardening tools inside. It is handmade to order in our Norfolk workshop and comes in a choice of 6 colours depending on your taste. It features traditionally styled windows with toughned glass and a cast iron black door furniture with a mortice lock. 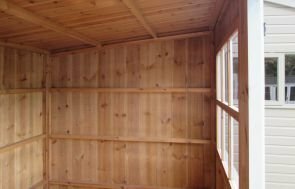 Crafted from FSC certified Scandinavian Redwood, we can guarentee this garden building will withstand all weather conditions. The National Trust range is based on National Trust property outbuildings in East Anglia from 50+ years ago. Styles and techniques were very different back then, and so the features from these old style buildings that have been incorporated into this range are the cast iron door furniture, the black corrugated roofing material and the vertical sawn boards for the cladding. 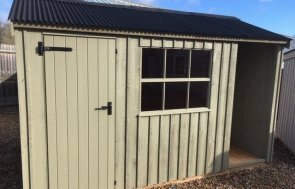 This Felbrigg shed has been painted in our Disraeli Green paint, which is the paler of the two green colours we offer for the National Trust range, and as you can see, it fits very well in the customer’s garden. For more information on this range, please use the link below.